Missing Jove? The largest planet in our solar system is currently on the far side of the Sun and just passed solar conjunction on September 26th, 2016. October now sees Jupiter slowly return to the dawn sky. Follow that gas giant, as an interesting set of double shadow transits transpires in late October leading in to early November. This particular cycle of double shadow transits involves the large Jovian moons of Europa and Ganymede. The scene on October 24th at 23:55 UT. Image credit: Created using Starry Night Education software. Europa and Ganymede double shadow transit season begins later this month, as both cast shadows on the Jovian cloud tops. This series of simultaneous shadow transits runs from October 17th to November 8th, and includes four weekly events. The double shadow transit season of 2016. Created by author. When can you first spy Jupiter, post solar conjunction? Catching this particular series of double shadow transits is challenging this time around, owing to the planet’s position low in the dawn twilight. The first event on October 17th starts with Jupiter just 16 degrees west of the Sun, and the cycle ends with Jove 38 degrees west of the Sun on November 8th. Keep in mind, it is possible to track Jupiter up in to the daytime sky, post sunrise. To do this, you’ll need a ‘scope with a solid equatorial mount and good sidereal tracking. The trick is to lock on to Jupiter before sunrise and track it up in to the dawn sky. Be sure to physically block that dazzling rising Sun out of view behind a hill or building, and NEVER aim your telescope at the Sun! Using this method opens up the possibility of nabbing a given double shadow event to longitudes due east of the quoted locales above. The waning crescent Moon also passes 1.4 degrees NNE of Jupiter on October 28th, offering another chance to spy the gas giant in the dawn sky, using the nearby crescent Moon as a guide. The Moon and Jupiter in the daytime skies on October 28th. Image credit: Stellarium. And another interesting pairing is coming right up on the morning of Tuesday, October 11th, when Mercury passes just 0.8 degrees (48′) NNE of Jupiter. Both are only 12 degrees west of the Sun at closest approach, which occurs around 10:00 UT. Still, both will appear as an interesting pseudo-double star, with Mercury shining at magnitude -1.1 and Jupiter only half a magnitude fainter at -1.6. Jupiter (arrowed) exiting the 15 degree wide field of view of SOHO’s LASCO C3 camera on October 5th. Image credit: NASA/ESA/SOHO. Callisto, the outermost large moon of Jupiter, ceased casting its shadow on Jupiter earlier this year on September 1st 2016. Callisto is the only large moon that can ‘miss’ the gas giant’s cloud tops. Callisto must be involved for a triple shadow transit to occur, and the moon resumes regularly casting its shadow on Jove on December 4th, 2019. And don ‘t forget: we’ve got a spacecraft currently exploring Jupiter for the next year and a half: NASA’s very own Juno. Be sure to check out the Jovian action over the next month, gracing a dawn sky near you. Flashback to 1995: Clinton was in the White House, Star Trek Voyager premiered, we all carried pagers in the pre-mobile phone era, and Windows 95 and the Internet itself was shiny and new to most of us. It was also on this day in late 1995 when our premier eyes on the Sun—The SOlar Heliospheric Observatory (SOHO)—was launched. A joint mission between NASA and the European Space Agency, SOHO lit up the pre-dawn sky over the Florida Space Coast as it headed space-ward atop an Atlas IIAS rocket at 3:08 AM EST from launch complex 39B at Cape Canaveral Air Force Station. There aren’t a whole lot of 20th century spacecraft still in operation; SOHO joins the ranks of Hubble and the twin Voyager spacecraft as platforms from another era that have long exceeded their operational lives. Seriously, think back to what YOU were doing in 1995, and what sort of technology graced your desktop. Heck, just thinking of how many iterations of mobile phones spanned the last 20 years is a bit mind-bending. A generation of solar astronomers have grown up with SOHO, and the space-based observatory has consistently came through for researchers and scientists, delivering more bang for the buck. SOHO has monitored the Sun now for the complete solar cycle #23 and well into the ongoing solar cycle #24. SOHO is a veritable Swiss Army Knife for solar astrophysics, not only monitoring the Sun across optical and ultraviolet wavelengths, but also employing the Michelson Doppler Imager to record magnetogram data and the Large Angle Spectrometric Coronograph (LASCO) able to create an artificial solar eclipse and monitor the pearly white corona of the Sun. Peering into the solar interior. SOHO observes the Sun from its perch one million miles sunward located at the L1 Sun-Earth point. It actually circles this point in space in what is known as a lissajous, or ‘halo’ orbit. SOHO has revolutionized solar physics and the way we perceive our host star. We nearly lost SOHO early on in its career in 1998, when gyroscope failures caused the spacecraft to lose a lock on the Sun, sending it into a lazy one revolution per minute spin. Quick thinking by engineers led to SOHO using its reaction wheels as a virtual gyroscope, the first spacecraft to do so. SOHO has used this ad hoc method to point sunward ever since. SOHO was also on hand to document the 2003 Halloween flares, the demise of comet ISON on U.S. Thanksgiving Day 2013, and the deep and strangely profound solar minimum that marked the transition from solar cycle 23 to 24. What was your favorite SOHO moment? 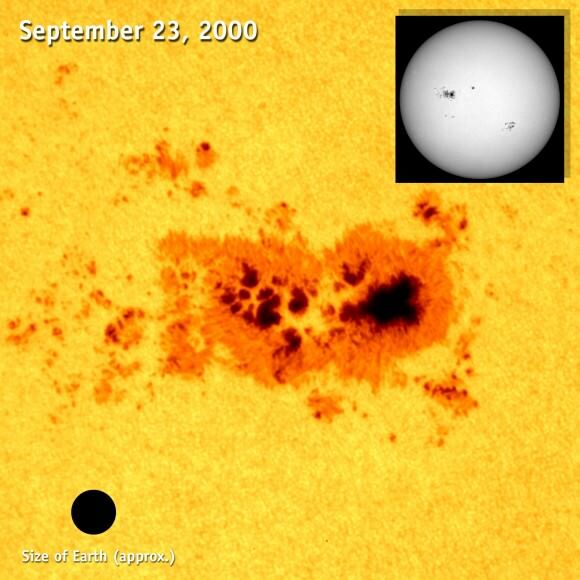 A massive sunspot witnessed by SOHO in 2000, compared to the Earth. SOHO is also a champion comet hunter, recently topping an amazing 3000 comets and counting. Though it wasn’t designed to hunt for sungrazers, SOHO routinely sees ’em via its LASCO C2 and C3 cameras, as well as planets and background stars near the Sun. The effort to hunt for sungrazing comets crossing the field of view of SOHO’s LASCO C3 and C2 cameras represents one of the earliest crowd-sourced efforts to do volunteer science online. SOHO has discovered enough comets to characterize and classify the Kreutz family of sungrazers, and much of this effort is volunteer-based. SOHO grew up with the internet, and the images and data made publicly available are an invaluable resource that we now often take for granted. A ‘neat’ image… Comet NEAT photobombs the view of SOHO’s LASCO C3 camera. NASA/ESA has extended SOHO’s current mission out to the end of 2016. With any luck, SOHO will complete solar cycle 24, and take us into cycle 25 to boot. Today, missions such as the Solar Dynamics Observatory, Hinode, and Proba-2 have joined SOHO in watching the Sun around the clock. The solar occulting disk capabilities of SOHO’s LASCO C2 and C3 camera remains unique, though ESA’s Proba-3 mission launching in 2018 will feature a free-flying solar occulting disk. Happy 20th SOHO… you’ve taught us lots about our often tempestuous host star. -It’s also not too late to vote for your favorite SOHO image.